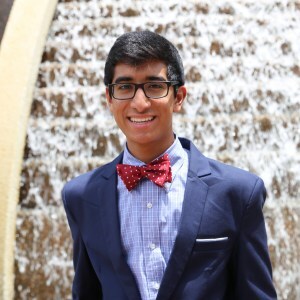 Tejas Athni is a dedicated and highly-motivated high school student who attends Stratford Academy in Macon, Ga. His interests range from scientific research to journalism to community service. He enjoys sharing his ideas and mentoring other students through public outreach programs. Currently, he is a student researcher at Karmanos Cancer Institute (Detroit, Mich.) and Fort Valley State University (Fort Valley, Ga.). Tejas has won numerous international awards, including winning the 2017 American Academy of Neurology’s Neuroscience Research Competition and being named a finalist for the 2017 Intel International Science & Engineering Fair, 2017 iSWEEEP International Science Fair, 2017 International BioGENEius Challenge, and the 2017 National Junior Science & Humanities Symposium. He has presented and discussed his research at various locations around the world, including universities, non-profit foundations, pharmaceutical companies, international medical and scientific conferences, and other speaking venues. Tejas is actively working on writing research papers that will be submitted for publication in peer-reviewed scientific journals. He has founded a non-profit organization called CPR Education NovoToro, which is dedicated to teaching basic life-saving skills. He is also the editor-in-chief of an international online magazine, Publizette, and a contributing author for The Huffington Post. Tejas has also immersed himself into community service throughout his high school career, amassing over 800 hours of service. He has volunteered at organizations such as Hephzibah Childrens Home, Morningside Assisted Living Residence, Coliseum Northside Hospital, and the Red Cross. Tejas’ long-term goals include pursuing a career in the medical field, either as a physician or a medical researcher.